Revell of Germany’s Eurofighter kit includes standoff missiles, the Taurus and Storm Shadow, with wings folded so they would hang under the fighter’s wing. 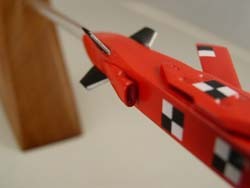 Since I was building the Eurofighter “clean” I decided to build one of these as a separate model, and enter it in the Unmanned Aerial Vehicle category at the IMPS Nationals...give those V-1’s a run for their money! 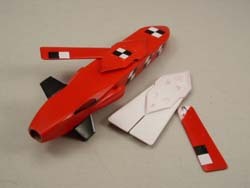 Each missile has a two part body; separate tail fins and the wings molded as one piece, folded, with “hinge cover”. The decal sheet has 18 stripes and stencils for one Storm Shadow while the poor Taurus has none! 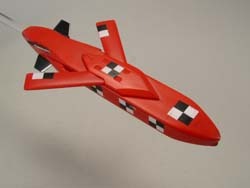 Googling for information found a bright red Taurus with black and white reference checkers. So the Taurus was chosen. 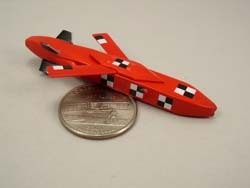 The only problem in assembly was the fins, which are small...tiny...and fit into recesses not slots. Fitting and getting the correct “angle” is a little tricky; fortunately the plans have a front view of the missile with the showing the correct angles. 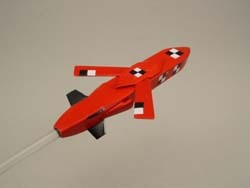 To build these missiles “flying” required opening the wings to that position. My trusty Dremel made short work of plastic removal but great care was required grinding under the hinge cover. The hardest part about the new wings was sanding the airfoil. After the hinge cover was glued to the fuselage, the wings were slid under the cover and “pivoted out” until the wingspan dimension was correct. The wings were not attached until all painting and decaling was complete. The kit has the engine intakes covered with a streamlined “nose”, correct when carried on the pylon. These were cut off and an opening made by drilling. 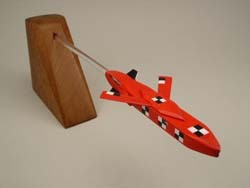 The kit’s exhaust was drilled out and a clear plastic rod inserted to hold the model and simulate the exhaust gases. Painting red requires a uniform base coat of white. Tamiya’s shake can white primer (great stuff!) provided this undercoat then Tamiya red for the finish color. The black fins and silver leading edges are decal which is much easier than masking. The checkers were made using white and black decal material. A large white square was cut and two smaller black checkers set over the white square, with a black square always in the upper right hand quadrant. Subsequent photos show the side fuselage checkers have the black in the upper quadrant to the front ...so only one side of my model is accurate! Add some stencils from a Super Scale sheet and it’s done!